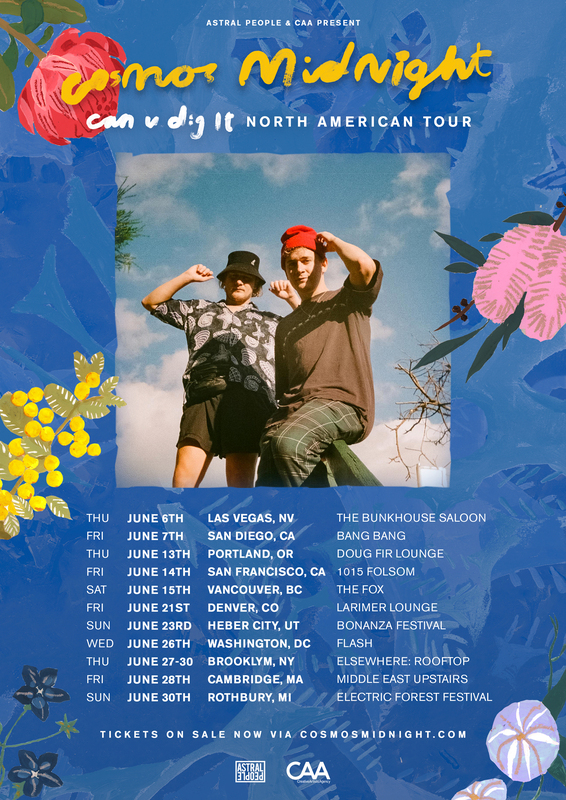 Cosmos Midnight have announced their biggest North American Tour yet, after delivering the first taste of new music this year with “C.U.D.I (Can U Dig It)”. Debuted at Laneway Festival in Auckland, “C.U.D.I” is yet another infectiously catchy tune we’ve come to expect from the powerhouse producers. Driven by a funky guitar riff and “can you dig it with me” vocal hook, the track jumps around between snappy synth melodies, delivering on their unique fusion of electronic, pop & funk. Having introduced keys, guitar and percussion to their live show in 2018, Pat and Cosmo have continued to show a careful consideration in their production with “C.U.D.I”, putting out yet another dance anthem that will have summer lasting all year round with each listen. Their debut, triple j Feature Album, What Comes Next featured a stack of feature talent, including Buddy, Jay Prince, Winston Surfshirt, Tove Styrke, Woodes, Panama, Boogie and Pauli The PSM. The pair debuted their all-new live show to multiple sold-out venues across the country, as well as Asia, UK & Europe, whilst their much adored singles "Walk With Me" and "History" received Gold status.